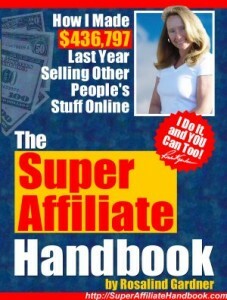 The Super Affiliate Handbook was published almost 11 years ago, in June 2003. Since then, tens of thousands of folks have read it and either become a Super Affiliate or started an online business of their own WITH an affiliate program. I have thousands of wonderful testimonials from all over the world about how my book has helped them. These are folks in the Internet and Affiliate marketing industry that YOU have heard of making millions after reading my book… i.e. Allan Gardyne (associateprograms.com), Allen Says (warriorforum.com), Amit Mehta (PPC expert) and more. You LIKED the Super Affiliate Handbook, right? Please do me a favor and leave a review on Amazon – where apparently MOSTLY ‘haters' bother to respond… even those who admittedly NEVER bought the book are allowed to give voice, whereas the thousands of happy customers that I've responded to via email and posted their testimonials on my site count for little. Please, make YOUR voice count. Please tell Amazon what you thought about my book — I'm about to release it's 11th anniversary edition and NEED all the help I can get. Thanks… from the bottom of my heart!! Those who DO leave a review WILL be recognized when the new Kindle edition is released in June. Hey Ros, just posted a 5 star review on Amazon for your book. I bought it years ago (hard copy) when it first came out and still reference it. Great work from a super person 1st and great author/teacher 2nd. I still remember and have the (unsolicited) personal email from you with nothing about business, just asking about me and “how’s things going”. Never had that from anyone I bought a product from, ever. I’ll be on board for your anniversary edition. Heading over to Amazon right now to leave a good post. Purchased your book several months ago and it’s helped me immensely towards starting my own online business. Thanks Ros for all your help. Hmmm… Many folks who aren’t verified purchasers of the paperback on Amazon (they got the digital version at http://superaffiliatehandbook.com ) have managed to leave comments over the last few days. I find if you go to the book page ( http://amzn.to/1f0iNpW ), click on Customer Reviews, then click on ‘Create Your Own Review’, the form automatically comes up for me. Rosalind, I left a five-star review but I am not a verify purchaser, so don’t know how much it counts. I also voted down some of the lower rated comments. I’ve always considered your book one of the best and look forward to the new edition. Your book was the first one I bought when I started online. I would love to give a good review for you. I’m not sure I have an updated copy. I sent a request to customer support but did not see a response. I may have over-looked it. Has there been an updated version? Thanks kindly for you help! There will be a new version for Kindle available on the 11th anniversary, which is in early June. It definitely opened my eyes to the life I could be living through an online business. Read it 7 years ago and am still going strong. Thank you, Brad and so glad to hear that it really got you going.. Keep up the good work! Definitely love to comment at Amazon. Your book touched many people and I would not have known it without Lynn Terry sharing. Thrilled to hear there’s an update in the pipeline, every success with the launch. The original book was an inspiration to me, so I am more than happy to support you with an amazon review. Your book was the first one I bought about the affiliate marketing and I cought the bug of learning marketing online. It was very good. Now I have my own product. Good luck with your Kindle version! Thank you so much and congratulations on your success! You are right, I will want comments on the new version as well, but I also wanted to boost the rating of the existing version before the new one is released. I am a big fan and have been trying to find the super affiliate handbook in stores in Australia and i am not having much luck I get strange looks and if they don manage to find it it takes 3-5 weeks to get it here so i don’t know what to do? I have read some of the reviews on that site and some of them say it is useless so i am not sure what to do? I rarely buy big books online because of the Costs to ship to Sydney Australia. It is much more updated than the one currently available on Amazon. Sure thing Rosalind! I read your book and it’s detailed, easy to understand, and it helped me a lot! I will do that now. Thank you kindly, Joe. Happy to hear the book helped you a lot! Glad to help you! You have helped me and so many others that this was an easy review…almost as easy as SAH was in getting me started back then. I brought some important books here to Thailand when I moved. SAH is here now, and I still use it. I haven’t bought the book, so I can’t (won’t) leave a review or a rebuttal. Wish I could, because these posts are always information packed, even if I don’t do AM! I *do* shop for books on Amazon a lot, though. On first look at your Amazon page, I noticed immediately that you haven’t included any “Look inside this book” pages. Has that been a considered decision lately, or an option not revisited since Amazon first introduced it (well after SAH was published, IIRC)? I ask because I think it would help more shoppers buy the book, in spite of the many “Yes-helpful” votes for the more-negative reviews (which seems to be their primary guidepost for *featuring* a review). Good luck with your ‘bury the (very old, ta-boot) haters’ campaign! Done and done. 🙂 Happy to help you my friend. Thanks kindly for the great review!! Ros – Where is my tiara? I bought your Super Affiliate a Handbook many years ago. It has always help a position of authority and trust in my mind with regard to affiliate marketing. I’m glad you continue to publish and update it. I bought your book a few years back and loved it! I thought it was extemely detailed and offered excellent guidance for anyone willing to follow it. I have referred to the book many times when I had a question or needed some reference information. I found your book to be extremely helpful with excellent tips and advice. I’m really glad I read the book, and am happy to hear an anniversary edition is being released! Thanks so much for your feedback, Patricia! I’ve put a review for you on Amazon. I love your book and wouldn’t hesitate recommending it to anyone who was interested in giving affiliate marketing a go. Done – it’s easy when it’s a good product, and yours is one of the best Ros! Btw within 15 mins of me posting my review you got a sale, so people DO read these reviews and all this stuff matters people! Ros, yours is actually one of the most detailed affiliate guides I have ever read. It’s no wonder the Amazon competition is jealous ,,, I would be too ! Thanks for reaching out to us Ros. With enough positive reviews, we can bury those haters, who are either trying to lower your scores to sell another book, or are just plain jealous of your success and the success of your students.